The below photo is of a juvenile Cottonmouth. This snake got its name because of the white tissue inside its mouth. When threatened, this snake may open its mouth, exposing its fangs. Or it might just bite. The bite of this snake is very serious, much worse than the copperhead. It's an aquatic snake, so you're most likely to find it near lakes, ponds, or swampy areas. They are fairly common in the south, and this one was caught in Orlando Florida. Here is a photo of a young Cottonmouth snake. 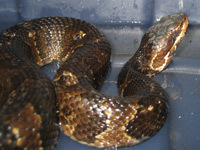 The above snake is brown with a pattern, but Cottonmouths darken as they age. 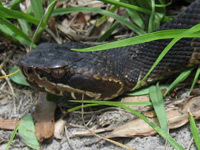 Click here for a photo of a black adult Water Moccasin (Water Moccasin and Cottonmouth are different names for the same snake) and you will see the difference in color. 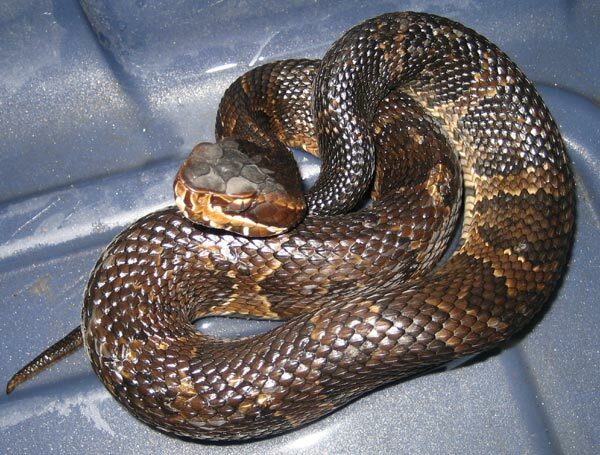 Cottonmouth snake facts - Cottonmouth snakes are also known as water moccasins. They are semi-aquatic, spending most of their time in the water. They demonstrate classic pit viper appearance: triangular head, heat sensing pits, and pupils shaped like slits. One of the reasons the cottonmouth is considered so deadly is because it is often mistaken for the harmless brown water snake. From a distance, cottonmouths can be distinguished from water snakes by the way their bodies remain mostly visible when they swim. Nonvenomous water snakes will remain completely submerged with the exception of their head. This viper gets its name from the pale, white skin inside of its mouth. When threatened, the snake stands erect and will open its mouth to display its fangs. Cottonmouth snakes are not usually nuisance animals. They remain near bodies of water and are not overly aggressive. The best way to deal with a cottonmouth snake is to leave it alone. These animals have no interest in human activities, and rely on the aquatic wildlife for their food. You may see these snakes basking along waterways. This is because the cool water temperature lowers their body heat substantially. The reptiles use the warmth of the sun to warm back up from a day in the water. 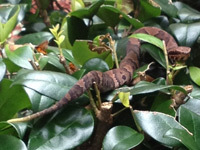 Go to this page for the difference between the Copperhead vs Cottonmouth. What temperature do cottonmouth snakes live in - Cottonmouth snakes, given their name by the striking white flesh inside of their mouths, are primarily found in or near bodies of water. Not only does this constant swimming mean constant cooling of body temperature, the snakes would only be able to survive in aquatic habitats of a certain temperature. It was widely thought that cottonmouths could not withstand cold climates, but it has now been proven that the snakes are active even during winter months. They come as far north as Northern Virginia. Moving any father above that line would result in harsher, longer winters where prey would be scarce. The cottonmouth spends a good amount of time basking in the sun to keep its body temperature warm. Constant swimming cools the serpent quickly. When they are not hunting, the snakes are usually sunning themselves on the banks. Despite the common location near a body of water, the cottonmouth will occasionally venture across land, far from any water sources. The best thing to do when you have encountered a cottonmouth is to leave it alone. These animals are not looking for a fight, but of all the vipers, they are one of the least likely to back down when threatened.